How far can I see before the Earth curves? 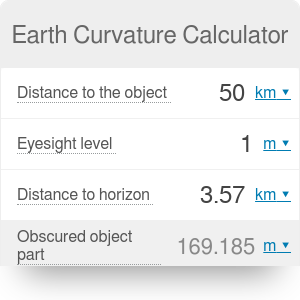 This Earth curvature calculator allows you to determine what part of any distant object is obscured by the Earth's curvature. It means that you will now be able to estimate the total height of a target that is partially hidden behind the horizon. You will also be able to tell you how far you can see before the Earth curves - that is, what is your distance to the horizon. Don't worry if you don't know what the curvature of Earth is yet - simply keep reading to learn all necessary information! Imagine you are looking at a sea. There is no land in sight, only the endless blue waters. You can also see a line that divides the sea and the sky. This line is called the horizon. Suddenly, you begin to see a point that is getting larger and larger. First, it is a top of a white sail; when it moves closer, you can also notice the shape of a ship. Where was this ship before? It was hidden behind the horizon. The reason for this is obvious: as Earth's shape is very similar to a sphere, its surface is not flat between you and the ship, but "bulges" up a bit, that's why it has obstructed you the view. The curvature of Earth is simply the measure of this "bulge". It is expressed as the height of the "bulde" per kilometer or per mile distance. How large is the curvature of Earth, then? We don't notice it in our everyday life, so it has to be quite small. Most sources consider 8 inches per mile as the most accurate estimate. It means that for every mile of the distance between you and a second object, the curvature will obstruct 8 inches of its height. r is the Earth's radius, equal to 3959 miles or 6371 km. This equation can be derived using the Pythagoream theorem. You can try to derive it yourself - it is not that hard! Determine the distance between you (the observer) and the lowest point of the object that you can actually see. Let's call this value d and assume it is equal to 25 miles. Measure your eyesight level - that is, the height at which your eyes are. We will denote it with a letter h. We can assume it is equal to 6 feet, which is approximately 0.0011 miles. If you have trouble with units conversion, simple use our length converter. Earth Curvature Calculator can be embedded on your website to enrich the content you wrote and make it easier for your visitors to understand your message.